T-Mobile had a more remarkable 2014 than any other American tech company. Sure, Apple (AAPL) unveiled the iWatch and Apple Pay. Microsoft (MSFT) has been on an absolute tear since new CEO Satya Nadella took over in February. Netflix (NFLX) solved its speed issues. And Facebook (FB) dominated the social landscape with its WhatsApp purchase. It has been a great year for tech. But no other tech company shook up its entire industry the way that T-Mobile (TMUS) did this year. Because of T-Mobile's actions in 2014, wireless carriers have fallen over one another trying to cut prices. Sprint (S) offered to halve your bill, Verizon (VZ) and AT&T (T) lowered rates while offering more data for your dollar, and you can now get a smartphone for $0 down at any carrier. There is real competition in the industry for the first time in forever. T-Mobile started its "Un-carrier" marketing push in March 2013, doing away with contracts, letting people switch phones every few months, and providing customers with free international roaming. This year, T-Mobile one-upped itsetlf. It offered to pay off rivals' early termination fees, announced that streaming music wouldn't count against customers' data plans, started giving out smartphones for free seven-day loans, provided free in-flight connectivity for customers and let people roll over their unused gigabytes. The "Un-carrier" moves have proven extremely popular with customers. T-Mobile CEO John Legere's famed antics have scored big points with amused customers (he recently told Yahoo's David Pogue that "If I was [Verizon and AT&T] I'd be sh--ing myself"). JD Power & Associates ranked T-Mobile No. 1 in customer service this year. As a result, the company is growing at an alarming rate. T-Mobile already added more than 3.5 million customers this year, more than any other carrier. The pink carrier commands about 18% of the wireless market, up from 11% at the beginning of the year. Nearly a third of new wireless customers or people switching their cell phone service are choosing T-Mobile. Yet T-Mobile's moves have been unpopular with shareholders -- the stock is down 21% this year, way more than Verizon and AT&T's far more modest swoons. Much of that has to do with the fact that T-Mobile failed to strike a merger with potential suitors Sprint or Dish (DISH). But shares also suffered as investors worried about how the marketing campaign affected T-Mobile's profit. 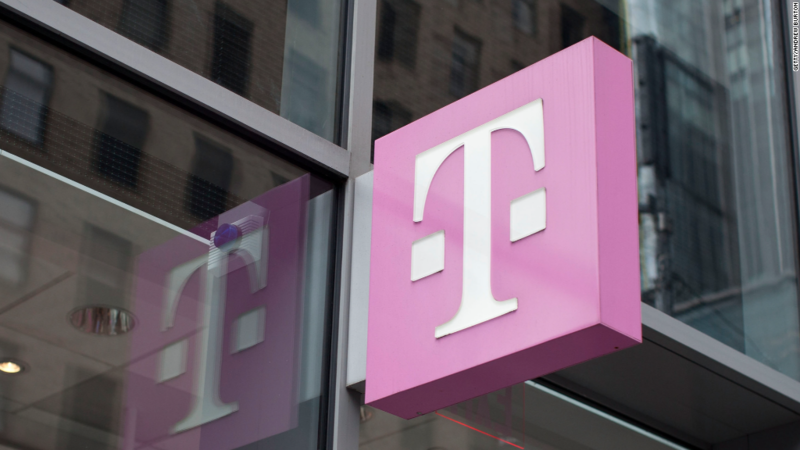 "The managerial histrionics that have played so well with consumers have worn thin with investors, who fear that T-Mobile is putting growth above profitability," noted Craig Moffett, senior analyst at MoffettNathanson Research. Many investors also have concerns about T-Mobile's network capacity issues. But there's reason to believe that T-Mobile's sell-off might be overdone. The company claims it has the capacity for all those new customers, and some new spectrum deployments will help it address its patchy coverage in the suburbs, which is currently dominated by Verizon and AT&T family plans. T-Mobile's 4G-LTE network now covers 260 million Americans -- up from zero two years ago. It plans on covering the same 300 million Americans that its bigger rivals cover by the end of next year. "There's always some Shmoe who thinks we don't have the iPhone and our network blows," said Legere during his latest "Un-carrier" stunt this month. "Those days are gone." Many Wall Street analysts believe that T-Mobile can't possibly keep this up -- it will eventually run out of money or get scooped up by a bigger player. But T-Mobile insists that it is financially viable and can continue its "Un-carrier" strategy indefinitely. If T-Mobile keeps impressing and adding customers next year the way it did in 2014, there might just be a case for its long-term success. "All this noise has masked a much more sober, and ultimately, a much more compelling narrative," said Moffett. "T-Mobile is an undervalued and underappreciated growth story."